This massive book clocks in at 193 pages, 1 page front cover, 1 page editorial, 1 page ToC, 1 page SRD, 1 page back cover, leaving us with a massive array of 188 (!!!) pages of content, so let’s take a look! So “Dunes of Desolation”, hmm? This pdf’s name would be considered audacious when used by most publishers -“Desert of Desolation” as a boxed set made some of my most precious, fondest memories back in the day – the glorious maze, the sky-boat at the pyramid’s top, the logical, cool social sandbox at the oasis, the sheer level of detail, the sea of glass – this beast had so much going for it. So how does this one fare? Well, first of all, this Book should be considered part of a direct line with Necromancer Games/ Frog God Games’ Glades of Death and Dead Man’s Chest – i.e. an extremely detailed environmental source-book in the style of publications of old, with a focus on information instead of x lame variants of races/classes as some other *cough* environmental supplements delivered. Thus, we begin this massive sourcebook with an array of considerations regarding deserts -from desert-types (hot and dry deserts, for example), to how they come to be to transition zones and handy tables to determine water availability, this section should be considered somewhat educational as well as simply useful and inspiring. The next logical concern would pertain to travel and settlements, which include not only handy tables to determine settlement types, concerns of tolls and desert animals of the fantastic variety and how to purchase them. Deserts as a dangerous place also sport a variety of hazards, which would be represented in e.g. proper stats for agave-poison and even peyote – but beyond that, the dangers of impure water are also addressed with a variety of nasty afflictions the PCs can receive. Taking the details one step further, the corrosive effects of deserts also receive their own rules and mirages, quicksand and similar iconic challenges are addressed alongside dangerous animals and vermin, rain…and, of course, temperature. The handy charts for temperatures, wind speed etc. are simply glorious (though I wished they were included in °C as well as in °F – while not complicated, my European mind still has to make the conversion and I always have to think a bit when I read °F until I remember the way to do it.). Among the more mechanic options, sliding on sand and dunes via acrobatics makes sense and the challenging survival DC-modifiers feel appropriate. We also receive an array of new feats and while the majority of them are okay, a couple really stand out – e.g. one that allows you to put ranks in fly sans a means of personal flight or one that allows you to deal regular damage to swarms. Much more enticing, at least for me, would be the selection of desert equipment provided -from detailed outfits to waterskins that contain al-haloon kidneys that can purify water to magical treats like a sonic crack of doom-rattlesnake whip, enchanted ankhs and astrolabes to better flying carpets (4!!!) to magical dates, enchanted harem veils, and, of course, genie lamps. What about an array of damn cool magical hookahs? We also are introduced to quite an extensive collection of new monsters, all of which come with beautiful, original b/w-artworks. Now regarding the beasts – from jackal shapechangers to serpentine threats, undead gunslingers, deadly cacti – a solid selection of creatures, including deadly demons, are provided. Many of these guys, gals and…things have unique signature abilities, which is nice to see, but even when they don’t they tend to evoke a distinct sense of…belonging. Much like reading old monster manuals, these creatures feel distinct – what about, for example a cherub-like being with a slumber-inducing breath? An evil killer-bunny relative to the Al-Miraj? It’s surprisingly hard to put the appeal of the creatures into words, for while they do not bombard you with awesome signature abilities or exceedingly clever builds, they feel like they’ve been taken straight from a mythology book of another world. They have this sense of cohesion and combination of imagery and concept that makes them feel, for lack of a better word…real. Or at least possible. Granted, the superb artwork does its fair share of the job here, but still – impressive. The same partially goes for the spells -getting a cactus-body, a buff to remain chaste, counter cursing – sabotaging divinations, excavating a den of thieves to hide inside – the spells have a very classic touch to them that should assure them finding homes in plenty a campaign. What about trapping foes in a giant hourglass of sand? While not all of the spells herein can be considered truly iconic or glorious, there is quite an assortment that does feel magical. The core classes also receive ample support in the guide of archetypes (and in the sorceror’s case, respective exclusive bloodlines) – from camel-riding mounted barbarians to scalp-takers, seductive concubines, the genie-hunting sha’ir, the keepers of the dead, palace guards, dervishs, sadhus, janissaries, to trance warriors, bazaar thieves and Viziers – while mechanically, these archetypes have in common that they’re solid, if not awe-inspiring, they do have something different going for them – they are unique. They feel right and concise and they are anchored within the context of the environment and setting. Their very concepts resonate and make them feel…cool. Yes, preventing foes from attacking you is one thing that can be achieved via many means, but as soon as your courtesan PC accomplishes this with an ability called “1001 Nights”, you’ll be grinning a bit broader, won’t you? The massively detailed chapter on religions follows this level of detail – providing essentially a massive origin myth, an explanation for the providence of the churches that adhere to one faith, but still are very distinct and different, taking cues from what amounts to saints turned deities, this chapter is massive in detail and the primary deities come in excessive detail – while sans e.g. obediences and the like , they otherwise stand in no way behind the deities provided by e.g. the Inner Sea Gods, with copious information on doctrine, clothing, clergy etc. being provided Comparably in short-hand, but also there would be two full additional pantheons, adding ample chance for religious strife, cults, etc. And here begins the section of the 3 adventures, so players beware, for the djinn pronounce woe upon the thousand year damnation of those players bound to tread within the following paragraphs and their SPOILERS. All right, DMs only remaining? Great! The first module, Child’s Play, is nasty – a particularly sadistic efreet has crafted a devious scheme – in the House of Thousan Delights, he grants people everything they ever wished for, offering for them to stay forever or return to their downtrodden, despondent existence – with the other option, of course, being a trap most foul, sending them to an extradimensional dollhouse replica of his palace to be hunted down there. When a djinn-blooded child runs afoul of this dastardly plot, her unusual physiognomy instead transports her brain and other parts of her into dolls – enter the PCs, who have to willingly enter the deadly playing ground and rescue her…of course, unbeknownst to the PCs, everything is MUCH more complicated, starting with the true master of the place being not as he seems – but in the case of nosy players still straying, I will not spoil the reveals – HINT: They’re awesome. The second module, King of Beasts, begins with beasts suddenly targeting men and becoming aggressive – coinciding with the notorious hunting troupe “Game Over” – to unearth the truth behind the attacks, the PCs have to deal with the grief of a sphinx in the guise of the lionweres serving it, prevent a dread curse from spreading, brave the desert sands in a rather epic trek through the hostile terrain, hone their detective-skills and finally, hopefully, manage to wrest the soul of an erstwhile force from good from the metaphorical clutches of a grimoire most foul. The final module, My Blue Oasis, asks the question when it is required to let go of life-long obsessions and dreams and what kind of cost one is willing to pay for a change for the better. Oh, have I mentioned that a dragon, derro, and a potentially cataclysmic 42 million tons of water are there to unleash upon the world? Yeah, if you want to make your world Cerulean Seas as a change of pace, here’s a very good option – and yes, here we have a type of artifcat that may spawn whole campaigns…wars even. The pdf concludes with a random encounters-table for desert creatures and a table of random desert events, much like a miniature wilderness dressing. Editing and formatting are excellent – in spite of the book’s size, it sports next to no glitches. Layout adheres to a printer-friendly two-column b/w-standard and the book comes with MANY awesome, original b/w-artworks. I have rarely seen this amount of great art in a non-kickstarter book – this one is beautiful in all the right ways. The massive tome also comes with neat cartography, though I wished key-less versions of the maps t hand out to players had been provided in an appendix. The pdf comes excessively bookmarked with nested bookmarks. I can’t comment on the print-version since I don’t have it yet. Designer Tom Knauss and conversion content editors Erica Balsley, Skeeter Green and John Ling have done a great job here: Frog God Games is not known for crunch-mastery or the like, but among the crunchy bits in their supplements, this ranks as one of the best so far. But you don’t buy this for the crunch, anyways, do you? Figured. At least if you’re ticking like me, you get Frog God Games-supplements because they feel concise, because they have this mythical flair, because they treat magic and the fantastical not as a commodity, while still managing to instill a sense of logical cohesion that makes the supplements and modules plausible and ultimately, relatable. This ephemeral quality extends to just about everything herein – even the crunch; The material provided herein in that regard is superior to Dead Man’s Chest and Glades of Death…and indeed, this is one glorious beast of an environmental source-book…even before the modules. Kudos to the conversion team and the obvious effort that has gone into making the feats et al. actually contribute something neat to the game – crunch-wise, this is perhaps the best book by FGG so far. And the monsters and modules…let’s just say there’s a reason I’ve been this opaque. Even in Frog God Games’ oeuvre, they stand out. The 3 modules are detailed, breathe the spirit of Arabian Nights and the fantastic in equal measures and deserve the moniker “…of Desolation” in that they do not stand one inch behind the legendary boxed set in imaginative potential and believability, perhaps even transcending it. Now in a book of this size, not all crunch is perfect, not every item can be a winner, not every spell mind-boggling – I do not claim that it is. What I can wholeheartedly claim is that this is the type of book that makes reviewing worthwhile – the writing is actually so good, I felt hard-pressed at times to step away and let sink what I’ve read. This made me dust off my 6 Arabian Nights-print-out and makes for a superb addition to any desert-campaign, even if you choose to ignore the Lost Lands-fluff. Add to that the low price-point and superb production values, and we have a collection of adventures that no self-respecting DM should pass by….whether you go for the Desert of Desolation, the Southlands of Midgard or to unearth the Legacy of Fire/Mummy’s Mask – I guarantee that this tome will make your desert more alive, more real. This is a glorious tome, a fun read, and well worth 5 stars + seal of approval, while also qualifying as a candidate for my best-of 2014 – get this awesome beast of a book! 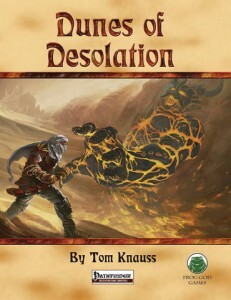 You can get this glorious tome of desert-awesomeness here on d20pfsrd.com’s shop!